Groovy Sneak Peak: The DelegatingScript Base Class · JVM. Blog. As shown by Guillaume Laforge at Gr8Conf 2013 in Copenhagen, Groovy 2.2 will come with a neat feature for writing custom DSL Groovy scripts: the DelegatingScript base class. 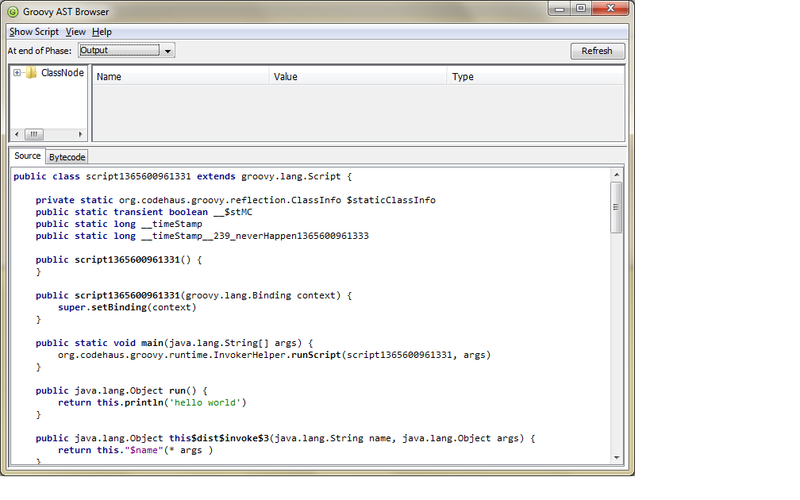 One way to write Groovy code is within so-called "scripts". At runtime, Groovy script code is converted to a Script  descendant class and an instance of that class is created. I nice tool to actually see the generated classes (and even byte-code) is the groovyConsole's AST browser bundled amongst other useful programs with the Groovy distribution. In the AST browser window you see our script class get's a randomly generated name and it is derived from groovy.lang.Script. A nice way to further customize custom Groovy scripts is to set a custom base class. A custom base class can be used to provide "global" methods and variables that might be shared within a group of scripts. For example, let's assume we wanted to write a bunch of Robot DSL scripts, we would create a custom base class containing the DSLs variables and functions. In order to set a custom script base class, we need to create an instance of CompilerConfiguration and run the script with that instance. // setting the delegate object here! As can be seen above, DelegatingScript provides a nice way for DSL scripts to remove all DSL setup code to the outside of the script. Groovy 2.2 comes with a nice feature to automatically delegate all calls in a script to a dedicated delegate object: the DelegatingScript base class.